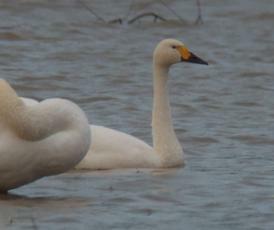 Tundra Swan and also as Whistling Swan. The smallest swan in the UK. 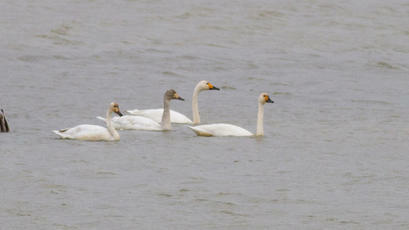 It has more black on its bill than Mute and Whooper Swans and is considerably smaller and more like a goose in shape. Found mainly in eastern England, around the Severn estuary and in Lancashire with concentrations at the Ouse and Nene Washes (Cambridgeshire), Martin Mere (Lancashire) and Slimbridge (Gloucestershire). The Bewick's Swan arrives in Britain in mid-October after spending the breeding season in Siberia and leaves around March. Feeds on leaves, shoots and roots. Although increasingly threatened by loss of habitat and man's activities, there are significant numbers in the UK. It is on the Amber List. Occasional winter visitor to Leicestershire and Rutland.